Writing this review on 11 January, it may not seem much praise to say that this is one of the best books I’ve read this year – but I am pretty sure I will still be saying that by 31 December. 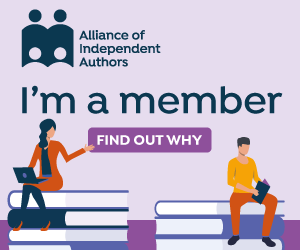 Who would have thought that such a great reading experience would have been the result of my first online encounter with the author, Francis Guenette? We met by chance on Twitter on the night of the last papal elections, sharing our amusement at the wry comments being made about the incoming pope, whose name turned out to be the same as Ms Guenette’s. 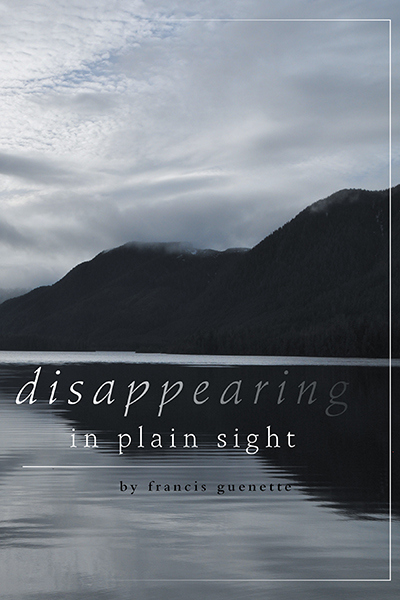 Francis (the author, not the pope), was just self-publishing Disappearing in Plain Sight, her debut novel, which stayed in my memory because of its beautiful cover, intriguing name and setting on Vancouver Island, where I had an aunt and cousins for many years, though I never managed to visit them there. I also enjoyed Francis’s blog, which features many more gorgeous photos of the local scenery and some interesting insights into the process of writing novels. Her book has been on my to-read radar ever since, and, having caught up with some books over Christmas, I was pleased to be able to start reading it a few days into the New Year. As I turned the pages, I started to neglect all but the essentials on my daily to-do list so that I could spend more time reading this fairly long book (6hrs 18mins according to my Kindle). If Francis is not on commission from the Canadian tourist authority, she should be, because she writes breathtakingly beautiful descriptions of the island, which she somehow incorporates without slowing down or distracting the reader from the story – which is quite an art. But such is the presence and vividness of the setting that it almost feels like a character in the book (and indeed in some respects it is, as it dictates certain key turns of the plot). The book tells of a group of disparate people, all damaged in some way, brought together in an isolated spot, some purposely seeking redemption, others just thrust there by circumstances. The story opens with new characters arriving to join those already living there, and with the feeling that their arrival will be a catalyst to change for them all. It reminded me of the start of an Agatha Christie story, building up a sense of foreboding as you get to know the players – and it would make a great film or stage play (though there the similarity with Christie ends). However, the changes – and the people who precipitate those changes – defy the reader’s expectations in a way that makes the story constantly engaging and intriguing, and had me more than once spending far longer reading than I intended, because I did not want to leave those characters at a moment of jeopardy. Slowly the author unpacks the characters’ emotional baggage by shifting the focus in successive chapters from one to another. (It’s all in the third person, though, so less tiring or demanding for the reader than it would be if written in the first person.) Guenette masterfully reveals what has made these underdogs what they are – and the top dogs too – so that only the hardest-hearted reader could fail to be moved by their plight. (I think I’ll never look at a stroppy teenager in the same way again, without wondering what brought them to their state of mind.) Without spoiling the plot, I have to say that the tales of redemption contained within this book are for the reader rewarding and life-affirming. As a complete optimist, I was rooting for hope and a happy ending, as I’d grown to love and respect the characters so much, while getting to know and understand them better. The conclusion, executed with great care and masterful timing, had the beauty and elegance of the end of a symphony. And, like great music, it had the power to move the audience to tears. I can’t remember the last time I cried at the ending of a book, or had such a feeling of creative completion, but this one did it for me. Postscript: On the night after I finished reading the novel, I happened to watch a documentary about one of my favourite pieces of music, Mike Oldfield’s Tubular Bells. This complex, dizzyingly inventive and individualistic album begins and ends with a simple, solitary note, topping and tailing a growing and declining interaction of very different types of musical instrument, including harmonies, clashes, and surprises, even shocks, which make the reversion to the simplest of endings so much more poignant and rewarding. It seemed the perfect match for the story arc of this book. I hope that makes sense to anyone else who knows and loves that music as much as I do. Read more about Francis Guenette and her work – and wallow in her beautiful pictures of Canada – at her website here: www,disappearinginplainsight.com. On a completely frivolous and flippant note, here’s my blog post about the new Pope Francis, with complete with some of the gems that came up on Twitter that night. Great review, and I heartily agree. This book is masterly crafted with much insight into the human condition while set in a breathtaking location. Great review, and I agree completely. I read the novel last April shortly after its release and was completely absorbed in it while on vacation in Mexico. The characters have remained in my mind and I look forward to learning their fate in the coming sequel! Thanks so much for this wonderful review, Deb. I am humbled in my sheer joy at your take on the characters and story. It’s a pleasure, Francis – the least I can do to thank you for providing such a wonderful read. Can’t wait for your next book now!